In the afternoon of April 27, the Chamber of Commerce and Industry of Vietnam held the 55th anniversary of the traditional day of VCCI (27/4/1963 - 27/4/2018). Dr. Vu Tien Loc, President of Vietnam Chamber of Commerce and Industry. 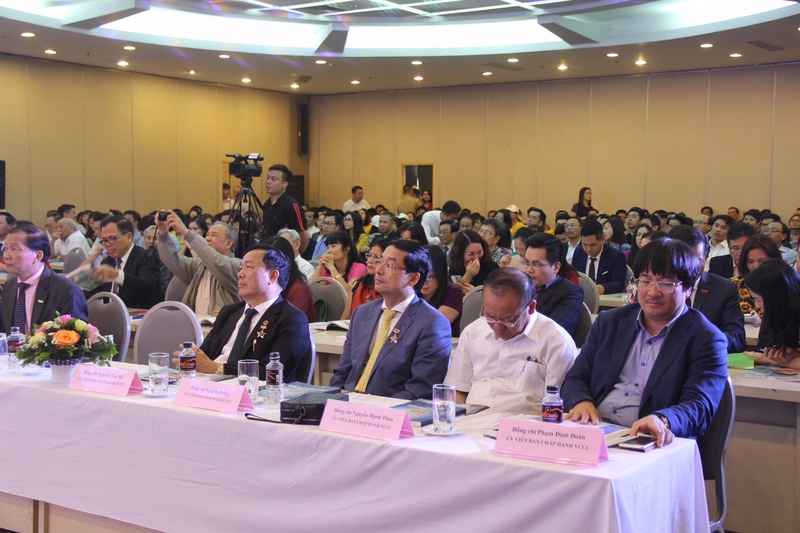 Attending the ceremony included Mr. Doan Duy Thanh - former President of VCCI; Ms. Pham Chi Lan - former Vice President of VCCI; Mr. Hoang Van Dung - Former Vice Chairman of VCCI; Ms. Pham Thi Thu Hang - Secretary General of VCCI. "Today we converge here in the sacred moment, the moment that 55 years ago, our Chamber of Commerce and Industry was officially born. We sincerely thank President Ho Chi Minh, the Government Council and Prime Minister Pham Van Dong for their historic decision to launch the Democratic Republic of Vietnam Chamber of Commerce (now Vietnam Chamber of Commerce and Industry) - representing the Vietnamese business community right from the beginning, "President VCCI opened his speech. VCCI president asserted that: ""More than a half of a century ago, through a series of fluctuations and vicissitudes of history, from a small organization of only 93 members with a compact secretariat, VCCI has step by step grown up and made a worthy contribution to the development history of the country and its businessmen: Struggle to abolish US imperialist sanctions during wartime, promote economic development and integration in peacetime ". "At every stage, VCCI played a pioneering role: is the driving force for institutional reform, integration and business development. VCCI now has a large membership community with more than 200,000 business and business associations representing more than half a million Vietnamese businesses and nearly 1,000 full-time and part-time staff. country. VCCI has been officially designated as the advisory body for the Party and the State, the socio-professional organization of the business community and the Vietnamese business community, investment and reliable partner of the international business community, "said Dr. Vu Tien Loc. VCCI is proud to be the national organization representing the rights and interests of more than 10 million businesses and millions of entrepreneurs - peacemakers in economic construction. Over the past half century, from a small organization with just 93 member companies with a lightweight secretariat, VCCI has grown up and made a worthy contribution to the country's development history. and Entrepreneurs: Struggle to Eliminate US Imperialist Embargoes in Time of War, Promote Economic Development and Integration in Peace. At what stage, VCCI also plays a pioneering role: the driving force for institutional reform, integration and business development. VCCI has more than 200,000 members and nearly 1000 full-time staff members. Review the journey of 55 years of aspiration to fly with landmark, April 27, 1960 The Standing Committee of the Government Council has approved the policy of establishing the Chamber of Commerce of the Democratic Republic of Vietnam. March 4, 1963 First Chamber of Commerce was held in Hanoi with the participation of the first 93 member organizations. On March 27, 1963, the results of the congress and its charter were approved by the Prime Minister's Decision 58 / CP signed by Prime Minister Pham Van Dong. During the war, Lawyer Duong Van Dat - Chairman of VCCI then regularly through the news agencies, international forums raised the voice of the business community and international friends opposed the US application. the embargo with Vietnam, and VCCI join forces with the Government of Vietnam against the unjust war. For more than 20 years of the first stage, commercial activity is governed by the pace of the centralized economy governed by the state's plan. The Division primarily performs the role of facilitator for export and import units of the North, establish trade relations with socialist countries. Ten years after the war, renewed wind was blowing across Vietnam. The Sixth Party Congress in 1986 made a great revolution, with the initiation of the cause of the renewal with the new view of socialist transformation. The country's economy is entering new opportunities and VCCI takes the lead in promoting investment and expanding key, potential markets, including national and territorial markets even without any diplomacy relationships had been set up with the nations such as the US, South Korea, Japan, Isaren and Taiwan. The first organization to come to Beijing in the 1990s, to resume its relationship with the International Trade Promotion Council (China). 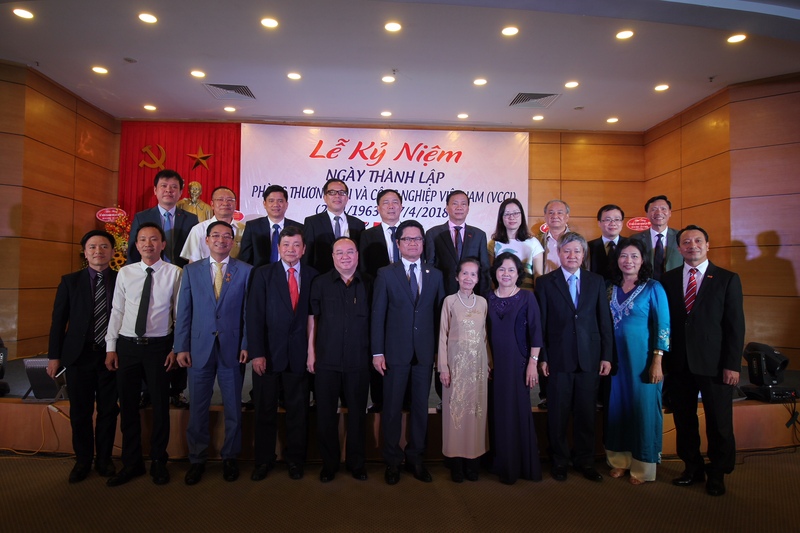 For 55 years way long, Vietnamese commerce - industry and businessmen community can not forget the leaders of VCCI have accompanied them on the way of advancement, the Vietnamese minds left their footprint into the new era such as Doan Ngoc Cung Pham Chi Lan, Doan Duy Thanh, Vu Tien Loc and many other leaders. After 25 years of being in the right place since 1993, VCCI has come a long way in comparison with its 55-years of journey. VCCI has researched and proposed recommendations for WTO accession negotiations, PPP FTAs ​​and international treaties, and other important policies of the Party and the State. VCCI is leading the trade and investment promotion activities with the United States after Vietnam and the US normalized trade relations in 2001. This is the footer for Vietnam joining the WTO in 2007. , officially opened new opportunities and challenges for the business community during the open market, international trade freedoms. VCCI has been assigned by the government to lead the trade and investment promotion project with key strategic partners in Vietnam. Over the past half century, through a series of ups and downs of history, from a small organization with only 93 business members with a compact secretariat, VCCI has grown up and has some worthy contributions to the development history of the country and the business community: Struggle to remove the embargo measures of the American imperialism in wartime, promote economic development and integration in peacetime. At every stage, VCCI has also played a pioneering role: the driving force for institutional reform, integration and business development. VCCI has been officially designated as the advisory body for the Party and the State, the socio-professional organization of the business community and the Vietnamese business community, investment and reliable partner of the international business community. Present at today's ceremony, Mr. Hoang Van Dung, Former Vice Chairman of VCCI affirmed the important role of VCCI in the process of developing the country, the process of complying and supporting enterprises. "At present, the number of private enterprises in Vietnam is still low, and it is necessary to have many employers and businesses in order to take off and develop the country. VCCI, together with the Party, will create more conditions for private businesses to develop and take off" Mr Dung said. Also present at the ceremony, Mr. Nguyen Van De, Chairman of Thanh Hoa Business Association affirmed, "VCCI always listens to business community, accepts opinions of business community". On behalf of the party, union - VCCI Standing Committee, Dr. Vu Tien Loc also thanked the leaders, the former leaders and staffs of the organization for their solidarity, creativity and commitment. With the development of VCCI, we also wish to continue our journey for business in the future.